Origin and Habitat: Stenocactus obvallatus is endemic to central México from the states of Aguascalientes, Durango, Guanajuato, Hidalgo, México Distrito Federal, México State, Oaxaca, Querétaro, San Luis Potosí, and Tamaulipas. Habitat and Ecology: The species is very likely to occur in desert scrub. 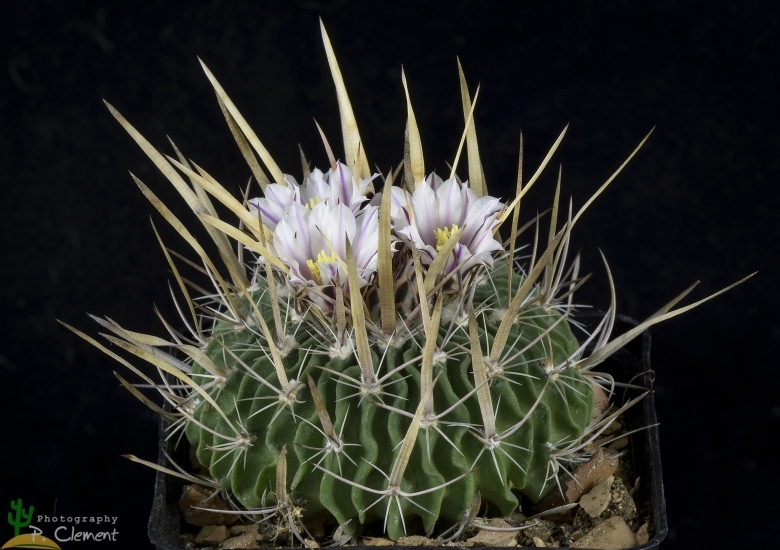 The genus Stenocactus is in need of taxonomic revision because there is a general lack of understanding on the taxonomic position of the species within the genus and thus is it no possible to define either the spatial or systematic limits of the taxon. It is not possible to establish its population size as its taxonomy is uncertain. Cactus obvallatus Moc. & Sessé ex DC. Echinocactus obvallatus var. pluricostatus Monv. 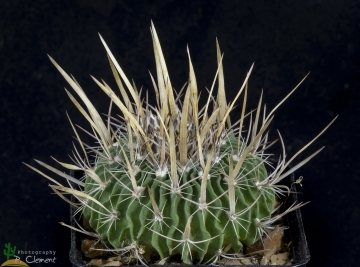 Description: Stenocactus obvallatus is a ball-shaped, cactus with wavy-margined ribs. White areoles each bear 5–12 greyish-brown spines. In spring, has pale yellow to pale pink flowers, with a purplish-red stripe on each petal. Stenocactus obvallatus is strictly related to Stenocactus multicostatus. However the two are easy to tell apart. E. multicostatus plants have many pale green ribs (as many as 120) where Stenocactus obvallatus typically has less than 50 blue-green ribs. Remarks: There is much variation within this species, the taxonomic position, habitats and ecology and populations size need further investigation, some of the “obvallatus” may correspond to other species. Stem: Obovoid to globose, usually solitary but sometimes forming two stems, greyish or blue-green, depressed at apex reaching a height of 6-10 (or more) cm and width of 6-11(-15) cm. Ribs: 25 to 50, rather thin and undulate, very broad at the areoles. Areoles: 2-4 on each rib. Spines: About 5-12, of which 3(-4) central spines subulate, ascending or spreading, the upper one flattened and wide, reddish brown, to 5 cm long, 3-4 mm wide, lateral 2 even wider, angular, spreading, and 4-6 radial spines shorter, white, perhaps not one-fourth the length of the longer ones (about 1 cm long). Flowers: Flower buds are are held in the wool of the stem's apex, often with just the tips visible until early spring, when some sunny days come along and both the buds and plant start to grow. The plant will throw quite a few buds in and open several 3 cm flowers at a time over the course of a month. If the conditions are right it can bloom again later in the year. The blooms are quitw large, pale yellow or white, with purplish midstripes and reddish center; perianth-segments linear-oblong. Stenocactus pentacanthus A.Berger: has only 5 spines, 3 major on the upper part of the areoles: two conical and curved upward while the central spine is flattened about 2 cm long and 2 mm wide and 2 small spine on the lower part of the areole. 4) Gómez-Hinostrosa, C., Sánchez , E., Guadalupe Martínez, J. & Bárcenas Luna, R. 2013. Stenocactus obvallatus. The IUCN Red List of Threatened Species. Version 2015.1. <www.iucnredlist.org>. Downloaded on 03 June 2015. 6) Hans Hecht “BLV-Handbuch der Kakteen” BLV-Verlagsgesellschaft, 1982. 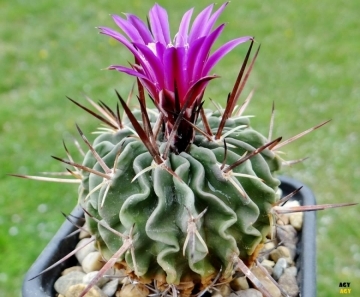 Cultivation and Propagation: Stenocactus obvallatus is easy to to care cactus, recommended for any collection that needs lots of light with ample airflow.